The RV Doctor: Product Spotlight: Eternabond - Products That Prevent Grief! Product Spotlight: Eternabond - Products That Prevent Grief! For you RVing veterans – have you ever looked back at how far the RV Industry has evolved over the years? I am amazed at how fortunate we are to be RVing in the new millennium! Just a cursory rearward glance makes prominent the many advances that affect how we enjoy the RVing lifestyle today. Consider wireless electronic technology, LP appliance efficiency and coach construction, just to name a few. Anyone remember when we could “override” the control system and manually light the pilot light on a refrigerator? Remember when appliances actually HAD pilot flames? Or when the basic difference between any two recreation vehicles of the same type was the brand name on side? Floor plans were, at best, utilitarian and only slightly varied between manufacturers. And just take a look at how construction techniques have changed over the years; from stapled stick construction with wooden studs and rafters and fiberglass batting to fully laminated, vacuum-bonded, sealed, full-length side walls and one-piece roof composites. Exterior roofing surfaces alone have seen a progression of sorts as well. Originally designed along the simplistic lines of mobile homes of the day, with rolled and cleated galvanized metal, the next permutation saw the move to lighter, painted aluminum with mechanical seams. Then one or two-piece aluminum sections; the thought being less seams means less chance of leaks. Fiberglass, ABS plastic, Filon plastic, all easy to fabricate and form into any design and lighter yet, eventually became the roof surface of choice. In more recent years, EPDM, (ethylene propylene diene monomer) rubber membrane, TPO, (thermoplastic polyolefin), and Hypalon, (chlorosulfonated polyethylene), have enjoyed a wave of popularity with many coach builders. Understanding the types of materials found on the exterior surfaces of any RV, (sidewalls, front and rear caps, roof and undercarriage), is crucial when it comes to preventive maintenance. And probably the most important is the roof. Think about it; unless covered or kept indoors, the roof remains exposed to all the seasonal elements, plus ozone, and UV bombardment on a constant basis. Such resulting deterioration is evident in the photo on the left. It’s no wonder most all RV experts proclaim water intrusion as the number one problem area for recreation vehicle owners. Allow rainwater and moisture to enter at any point then ignore it and in time, stains, mold, mildew, rot and extensive structural damage will likely follow in close progression along with an escalating cost of repair. It’s simply an “RV Fact of Life,” one that screams for a preventive maintenance regimen. So what’s to be done regarding the prevention of moisture intrusion? Especially when RVs have so many different roofing surfaces and construction variables? Say hello to the RVers newest best friend – Eternabond. 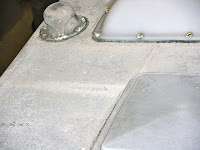 One dilemma paralleling the evolution of RV roofing surfaces over the years involves the types of sealants used to prevent water intrusion for those surfaces. Simply put, all sealants are not applicable to all roofing surfaces. All but Eternabond, that is. 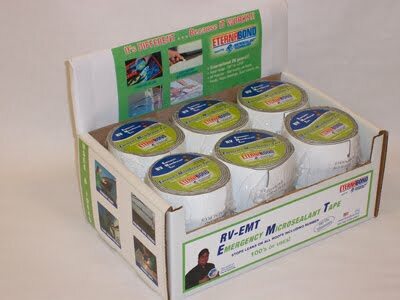 If I had to choose but one positive attribute (among many) of Eternabond Tape, it would be that Eternabond will stick to virtually ANY roofing surface found on ANY RV, regardless of age or type of material. Long a staple of quality RV service and repair shops, and currently found on many brand new coaches right from the factory, Eternabond is now packaging certain aftermarket products geared for the proactive RVer; products that every coach owner should have in the tool kit. 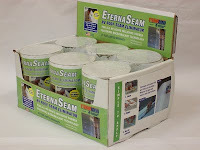 We’ll take a look at a few of these products, but first a little information about Eternabond’s unique MicroSealant Technology, common to many of their products. 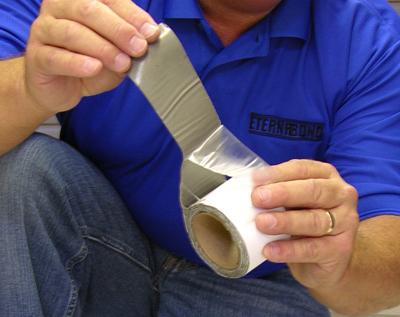 Formulated from synthetic, non-butyl rubbers and resins, Eternabond’s MicroSealant Tape contains a built-in primer that is activated once the release liner is peeled away and the tape installed to a surface. Pressing vigorously or rolling the tape once it is placed creates a molecular change that basically fuses the self-sealing tape onto whatever surface it was placed. Though it is quite tolerant of chemical infiltration, it is still best to only install it to a clean and dry surface. And if you are concerned about using it during extremes in temperature, don’t be. As long as you install it in temperatures between minus 20-degrees F. and plus 125-degrees F., you’re okay. I realize I said that with my tongue firmly planted in my cheek, obviously, but in reality, because it IS so robust and workable within such a wide temperature range, it endears itself perfectly to all RV applications as well as a multitude of industrial applications. The only caveat – it will not stick to silicone! If you or someone tried to repair a roof leak using silicone, it will be necessary to remove all the remnants of it prior to applying Eternabond tape. At least the silicone located at the edges of the Eternabond Tape. By the way, the release liner being removed in the photo here is made with a silicone component. That’s why it can be peeled back. 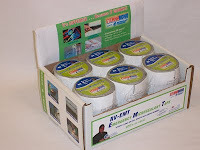 Think about it; Eternabond tape has to “not stick” to something in order for it to be rolled up and packaged! Here then, are some of the products I have used and that have worked fantastically for me. EternaSeam – RV Roof Seam Eliminator: This pre-packaged kit come complete with everything needed to seal any front or rear cap. When sealing both the front and rear caps, two kits are required. Low temperature flexibility 1/2-inch radius at minus 30-degrees F.
Temperature flexibility range Minus 70-degrees to >200-degrees F.
Water vapor test (ASTME 96B) .005 grams/100 sq. in./24hrs/100-degrees F.
The Roof Seam Eliminator Kit contains a 6-inch by 10-foot roll of tape, specifically designed to cover any front or rear cap seam. Remember, it can be installed right over the old sealant or caulking unless it is silicone. Use the included squeegee to initiate the MicroSealant particles. Once you rub it into all the cracks and crevices, you’re done…probably forever! It should be the last repair you’ll ever make on that cap seam. And it’s guaranteed for 25 years! DoubleStick Tape – Putty Tape: DoubleStick is used between any two surfaces such as when installing windows, roof vents, sewer vents, etc. I recently used it between the sidewall and the flange of a water heater during installation. 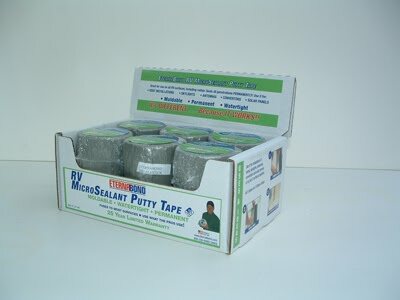 RV EMT – Emergency MicroSealant Tape: Every RVer should have a roll or three of this product in their traveling tool kit at all times. The smaller width and shorter length make it the perfect repair material for those smaller jobs such around a sewer vent, TV antenna or for repairing small cracks or tears in the roofing surface. This is the material I used to seal a leaky TV antenna is this short repair video. 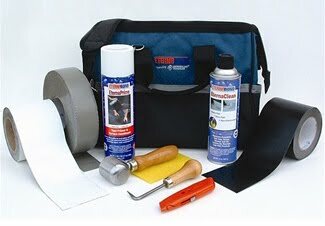 Ultimate Roof Repair Kit: This is the kit I personally use and the one I recommend to RV service shops, mobile RV service technicians and those RV handypersons who are often asked to help out around the campground. It contains an assortment of widths and lengths of Eternabond Tape as well as a can of EternaClean and EternaPrime and a hefty steel roller for activating the MicroSealant Technology. If you viewed the short video presentation above, you saw me use some of these products to repair that leaking television antenna. As you use the products in the kit, simply re-stock when necessary. Just as one viewer commented on the video above, I too, can attest to how handy it is having everything you need in one sturdy tool bag as you climb up on the roof! I guess I’m a bit jaded after so many years in the RV Industry; it’s hard for me to get too excited about a repair or maintenance product. But once I realized how effective and easy it is to permanently facilitate roof repairs (among other tasks), using Eternabond, I was on the bandwagon for good. And the fact that it is so convenient to carry a few key products with you as you travel all but guarantees you can nip water intrusion in the bud at the first sighting, thereby thwarting a costly restoration. I may be going out on a limb here, but suffice it to say I cannot fathom the thought of traveling in any RV without Eternabond. Plus remember, RVing is more than a hobby, it’s a lifestyle!